This is the page where you can post your questions for me to answer. By submitting your question below you will have your own page created with your questions and you can also add up to 4 photos that can be submitted as well to help illustrate your question, and your page will also display my Answer to your question. Please note, I am still learning how to use all this interactive software, so I apologize when it takes me a while to work out how to technically answer your questions online. Some answers I simply add by using the "Comments" box, so when you see the question page on any of the links below, make sure to click the 'comments' link to read any answers I have loaded using that form! If you are ever in a desperate hurry for an emergency answer, please EMAIL ME on the website email Contact Us form, as I can at least work out how to answer emails - lol! You will read the FAQ answers below the form right here, feel free to add your questions too of course! Single pair vs. colony breeding? 1 month old baby finch keeping his head turned. Small clutches normally die, Why? Do you know what species of finch this is? is it normal for a breeding gouldian hen to lose some facial feathers? My gouldians are hanging out close to the full spectrum light ? That's fine. Perhaps they are enjoying the additional heat that bulb puts out. Separating the male and female gouldians after the breeding season. Frustrated with breeding and rearing!!!! what is the total age of a gouldian finch? Feather eating mites in gouldians? What insects does a gouldian finch eat? 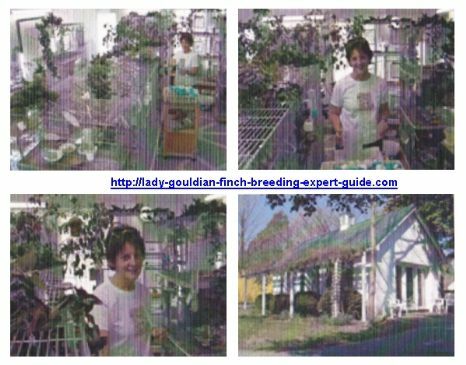 Can lady gould finches survive in the cold? How many clutch per season? What is the healthy average weight of a Gouldian finch female? Lady Gouldians usually weigh anything between 15 - 30 grams, or 0.5 - 1 ounce. I will try to answer every question as soon as they are submitted, but it may take a few days if I’m not on the site every day. Remember to check the "comments" link on the question page, as that is where I may have posted my answer to the question. You can also make comments on Frequently Asked Questions, and on my replies, so feel free to add your contribution!